What Happens To The Charles River If 100-Year Storms Are The New Normal? UPDATE: Watch a video that takes you behind this essay, here. On a still September morning in Watertown, the Charles River is a dark sheet stretched taut between its wooded banks. Clouds are piled up in billows of steel and silver, hinting of a storm that approached overnight but never arrived. Their peaks are luminous, but the river is shadowy in the pallid early light. The first nip of fall has mottled the lush verdure of summer. 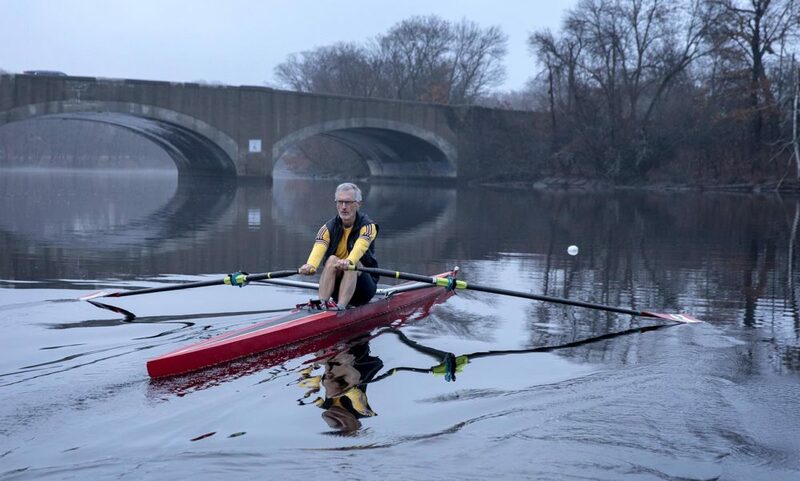 The hull of my single scull rips the river’s glassy surface. 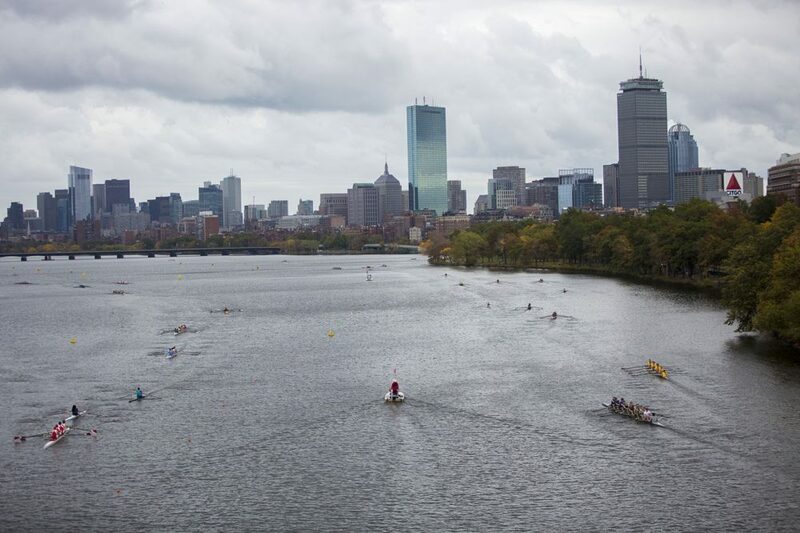 From a rower’s low angle on the water, the Charles is a broad boulevard that pulls the eye to a distant bend. As I row, my thoughts turn to other waterways hundreds of miles south, in Virginia and the Carolinas. Flooding in the aftermath of Hurricane Florence transformed placid rivers like this one into killing torrents that brought chaos and destruction on a historic scale. Florence has thus far taken more than 40 lives. 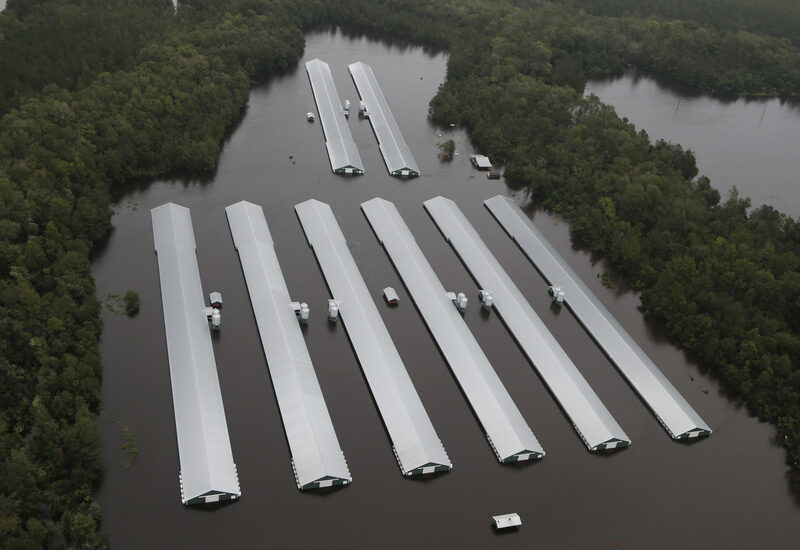 The toll on livestock is as unfathomable as it is unconscionable — 5,500 hogs and 3.4 million chickens drowned or crushed in collapsed barns. Around the region’s many factory farms, a bacteria-laden slurry of animal excrement overspreads the landscape. It was only three years ago when the Carolinas saw unprecedented autumn rains — at that time, the highest 24-hour rainfall total recorded in the U.S. Then last year’s hurricane season brought the deadly trio of Harvey, Irma and Maria. Scientists have elucidated the causal relationship between the warming climate and the heightened severity of recent tropical storms. Higher ocean temperatures and a warmer atmosphere cause storms to carry more moisture, which translates to more rain. And sea level rise multiplies the threat of ocean storm surges that accompany hurricanes. The sobering reality of climate change is that we haven’t yet felt the full effect of damage already done. Also due to climate change, storms are moving more slowly, which increases the harm they inflict. Like Harvey in 2017, which dumped 56 inches of rain on Galveston, Texas, Florence traveled unhurriedly along its path. Climate research suggests that warming in the polar regions may be weakening the winds that drive weather systems, causing them to linger longer and accumulate more precipitation. I watch a great blue heron patiently stalking fish along the shoreline. I wonder how the Charles would withstand an event like Florence? Just a few miles downstream, where the river meets the harbor beyond the Zakim Bridge, the new Charles River Dam controls the height of the lower Charles and protects the Charles Basin from storm surges. The dam dates to 1976, before the extent of sea level rise during this century was foreseen. Last year, the city of Cambridge issued a climate vulnerability study that modeled the effects of projected sea level rise and concluded that the dam will likely hold under conditions prevailing around 2030. But by 2065, as the ocean continues to warm and rise, a storm surge that could overtop or flank the dam becomes a worrisome possibility. A 100-year storm in that time frame would see the waters of Boston Harbor coursing through the streets of Back Bay and Cambridgeport. The potential devastation from such an event, combined with the flooding of the Mystic River (which is at a higher risk than the Charles), challenges the region’s long-term planners. They would like to avert a disquieting set of contingencies that includes the infiltration of salt water into the city’s infrastructure, the flooding of subway tunnels, and the contamination of Cambridge’s water supply at Fresh Pond. The loss of life and property would stagger us for years. Pausing now, I let my oars skim flat, and the boat’s quick glide slows to a drift. The sobering reality of climate change is that we haven’t yet felt the full effect of damage already done. Even if the world figures out how to stop burning fossil fuels within a couple of decades, the blanket of greenhouse gases we’ve created in the atmosphere will persist. It will weaponize nature against us in ways never seen. The measures that some nations are taking now to reduce their carbon output will help avoid the worst-case scenarios, but they won’t forestall a world made harsher and crueler than today’s. I pull the oars and resume my course downstream. 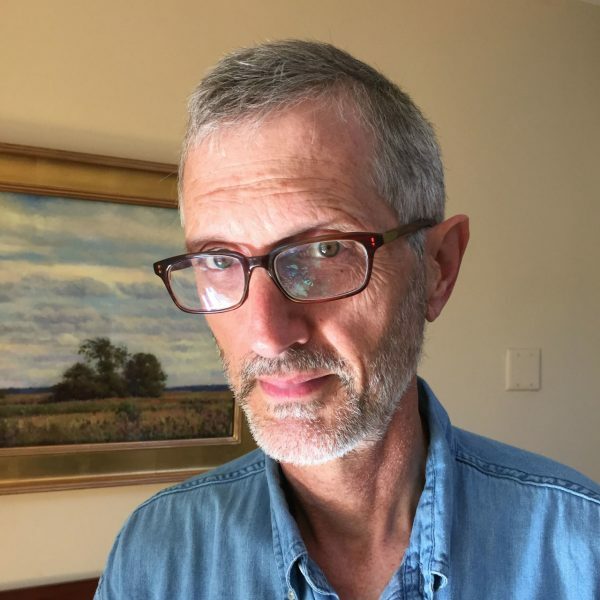 Philosopher Roy Scranton exhorts us to confront not only our individual mortality but the death of our civilization as well — an outcome that has become incontrovertible in the age of climate change. That means even as we work to bring about the best possible future, we mustn’t fail to accord due value to all that we still have. On this quiet morning, I value the peaceful river. Perhaps only one or two more generations will be able to experience its beauty in the same way. That is a truth, sadly, I am obliged to accept. Also by Fred Hewett: Coal Mining Is A Dying Industry. So Why Does It Play An Outsized Role In Our Energy Policy?